It’s interesting holding an elephant tusk for the first time. You’re not quite sure what to expect. But the first thing you notice is that they’re heavy, heavier than I expected. This aspect distinguishes elephant ivory from other wildlife products. It’s heavy, and it’s going to take up space. This has to affect the smuggling techniques. Last month there was another bust of smuggled ivory in Hong Kong. There were 189 tusks with an average weight of 4kg each. The origin of the shipment was (ironically) the Cote d’Ivoire. 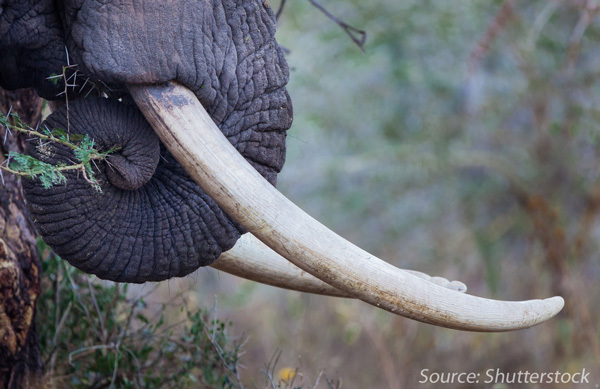 West Africa continues to play a dominant role as an export centre of poached ivory. This was the third major bust by Hong Kong customs this year. The common denominator is that they’re all shipped, concealed, in containers. The novel aspect of this shipment is the conspirators were trying to spread their risks this time. Rather than the tusks being on one ship, they came in containers on three different ships. This suggests the effect of several big busts in late 2012 and continuing to 2013 is increased wariness. Of the illegal wildlife products I’m familiar with, containers are a technique that I think, specialised for ivory. I can’t think of any other wildlife product that relies so heavily on containers. So, aside from I think firearms, here’s a question for the economists (or anyone else who knows). Is there any other illegal product that depends as much on shipping containers for distribution as ivory?